Bushwalking Skills: Bushwalking Fitness | Is stretching a waste of time? Is static stretching a waste of time? Does static stretching before exercise prevent muscle soreness and injury? Can static stretching beforehand reduce power during a bushwalk? With a couple of almost 3000m Canadian mountains (Mt.Begbie near Revelstoke and Mt Tupper near Roger's Pass) to climb in September, and with the festive season having played havoc with my fitness, I have again made my annual New Year's resolution to improve my fitness. 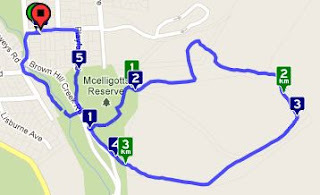 My usual weekly keep-fit regime involves 3 or 4, 45 - 60 minute walks on rugged and hilly tracks near my home, interspersed with a Pilates class or two, and as I approach a major bushwalk/climb, 1 or 2 bushwalk-specific weight resistance sessions at my local gym. In hot weather, I cool down after my morning walk with a 1 km swim. While annual gym fees are substantial, cutting back on my wine consumption by a glass a day, more than pays for the cost! This training schedule may seem excessive to some, but I've found that to enjoy a bush walk, and in some cases a 10-12 hour day with a heavy pack, that a high level of fitness is needed. As I get older, it takes more effort to reach and maintain the same level of fitness. I find that, as I usually train on my own, I need some incentive to improve and for this I use the highly regarded iPhone app Walkmeter which enables me to compare my times from walk to walk and from stage to stage within the walk. It even allows me to select background music with appropriate BPM (beats per minute) and gives me feedback throughout the walk as to how I rate compared with my best, median and worst times at key points ( see map above) along this route. All of these statistics, including calories burnt, can be viewed online , exported to Google Earth (kml or gpx files) or shared with your training partner. As I have been noticing a little calf muscle soreness during these walks, I thought I would investigate if a stretching regime could help. To my surprise, I found that the benefits of stretching were rather controversial. Part 2 of this post outlines a bushwalk training session which has been designed for me by a professional trainer and includes a warm up with dynamic stretches, training walk, and a cool down including static stretches.